Quick 4 day production time with a graphic printed on glare resistant, curl resistant, scratch resistant polyester film. Our polyester film gives a superior look compared the vinyl used by most of our competition. Our mini tabletop retractable display offers a great solution for a tabletop display. Great for shows where floor space is limited. Stand comes with a 2-part pole so it can be set-up at 2 heights (16.5" or 31.5"). The whole graphic rolls into the base of the roll-up for a flat package that fits neatly into the included carrying bag. 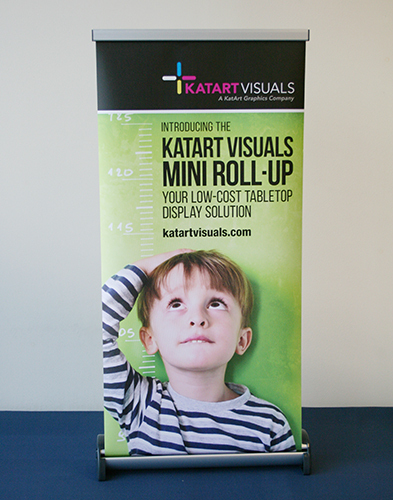 Price includes custom printed graphic from your artwork and installation into the roll-up stand. Comes with a matching carry bag. Graphic is printed on glare resistant, curl resistant, scratch resistant polyester film. 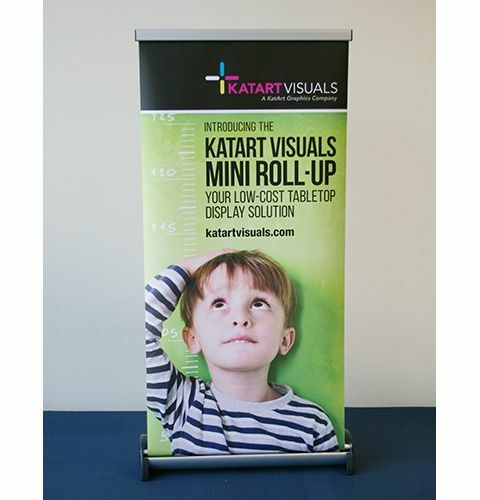 Viewable Graphic Area: 15.5" x 31.5" or can be setup as 15.5" x 16.5" using only one part of the pole.